Great location and very quiet atmosphere. Recommend to anyone looking for a good nights rest. They’re really 5 minutes from the walking street, it’s the part of town where the locals go (great access to the two local markets) and around the corner from tasty and cheap food options. Clean rooms, comfy beds w/curtains, free bananas. There’s actually a noodle shop next door, and you can ask Eddie where to find the best Khao soi. Eddie and Leo are good people, and if you’re lucky you’ll get a chance to meet some of their friends. Hanging with locals is always dope, Pai locals - even better. Owner and staff were beyond friendly and helpful, can't recommend highly enough. Some bread and tea etc available at all times for guests, as well as water. Privacy curtains on the beds, decent sized rooms. Great location for the walking street and restaurants. All around Nice experience, would stay again in a heartbeat! Super duper extra nice staff. The host took me and bunch of other people two times to see all of the tourist attractions and with him we did two times a cooking class for thai cuisine. On top of that he didnt ask for any money, he did it simply because he is so good person. The hostel is really good located, its silent, but at the same time has really nice atmosphere. The facilities and the rooms are in good shape and clean. I will come here again! Good location, right next to the walking street, staff were really helpful. Really great stay at this hostel. Lovely and clean and very friendly staff who were happy to help with anything we needed! Breakfast included was basic but fine, toast fruit and coffee! 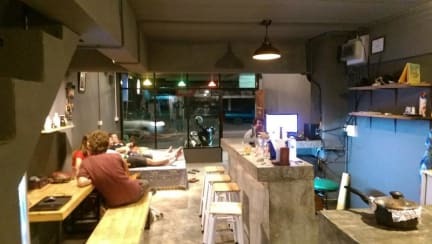 Great location about 5 mins walk from the walking street. Only thing was that the air con in the room wasn’t great so it was quite hot at night and we booked a 4 person room but were put in an 8 with 5 people but apart from that we had a really great stay! Awesome hostel in the centre of Pai! Walking Street is 5 minutes away, but you don't get all the noise as you're not directly on it. The staff is super nice, they seem to really like having the hostel. They even let me leave my backpack there while I went away for a couple of days :) I would definitely come back here if I went back to Pai! We only stayed here two nights but enjoyed our stay. The rooms were comfy with air con and clean. The showers were good but could have been hotter. 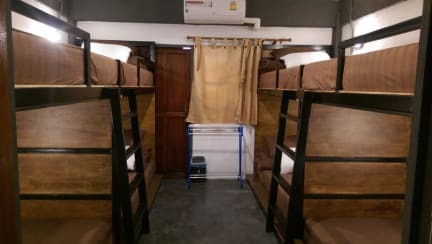 The location of the hostel is good, easy to get around Pai and only a short walk from the bus station. The hostel also provided free coffee bananas and toast every day.